Get your New Year’s Resolutions off to a great start with these 5 essential organizing ideas! Was one of your New Year’s Resolutions to get organized? While I’m a decently organized person for the most part but there’s always room for improvement. I’ve put together some ideas that I’m incorporating into my home life right now and hopefully they will help you, too! There’s nothing more stressful than realizing after a long day’s work that you have no idea what you’re making for dinner, let alone if you even have enough food in the house to pull something together. I’ve started basic meal planning (just dinners since we eat mostly the same breakfast and lunches) on a Sunday and it has made a world of difference to my week. I love these free printable menu plans from IHeartNaptime and I hope they’ll be as useful to you as they have been to me! This one has been way more of a game-changer than I initially thought it would be. 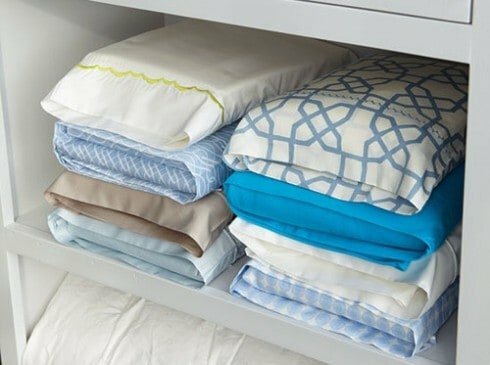 Instead of just folding all your bed linens and making a pile for fitted sheets, a file for pillow cases and a pile for flat sheets, this method will have you fold everything and place inside one of the pillow cases. Not only does it create a neat little package for your closet but it makes it so much easier to grab a fresh (whole!) set when you need to. While we’re talking about linen closets – go through yours and throw away any old towels that are frayed, discolored or generally looking the worse for wear. You can actually keep old hand towels and dish towels as rags or for those times when you need an old towel to place under something wet – but you don’t need them taking up space in your linen closet. You don’t use them because they feel awful against your skin and you’re certainly not going to be giving them to guests, so why keep them? I don’t know about you but I’m the kind of girl who needs a place to put everything. You know that phrase – a place for everything and everything in its place? I’m so good at doing that AS LONG as I actually have a place for things. If an item doesn’t have a designated spot, it will inevitably end up on my kitchen table, my bedroom chair or in a pile on my office floor. That’s why adding as much storage as possible is really important to me. One really easy way to do this is by adding simple melamine shelves to closets. We’ve added a crazy amount of extra storage in every single one of the bedrooms in our house and it has both been cheap and quick to do. You can see my full tutorial for these simple DIY shelves here. I used to be really good at rotating out my clothes as the seasons changed. Then I had two kids and was a variety of dress sizes for the longest time. Now that I’m back to my normal size, I can get back to doing this seasonally. If you don’t already do this, the concept is simple – get a bunch of clear plastic containers (just because it’s easier to see the contents) and put away clothes that are out of season. There’s no reason to have tank tops, shorts and beach coverups crowding up your closet in January, right? The same goes for the middle of the summer, there’s no need for snow pants and heavy sweaters. Label your bins and stick ’em up in the attic and bring them down again when it’s time to wear them! 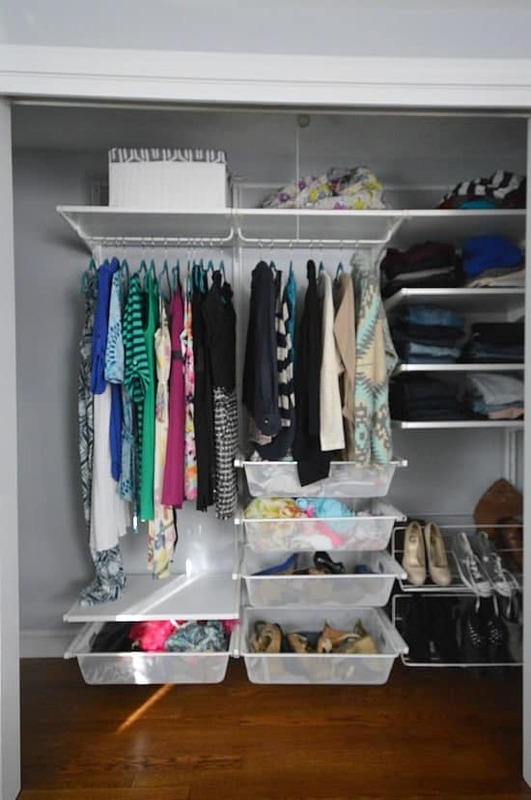 Not only will you have WAY less stuff in your closet but it will be easier to pick an outfit everyday because you’ll only have the clothes in front of you that you can wear! P.S. The closet above was designed using an inexpensive IKEA closet system. It’s another great solution for adding storage. You can read all about it here. Now that I’ve shared some very simple ideas for organizing yourself and your home in 2018, I’d love to hear your favorite ways to organize or any other New Year’s Resolutions! Drop a comment below or reach out on Instagram or Facebook – I’d love to hear from you!